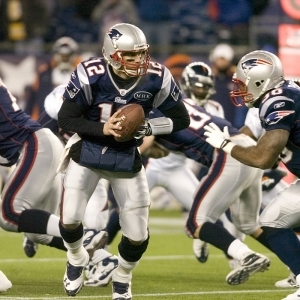 When the Super Bowl is just around the corner, and I set out to write an article about the most Super Bowl rings held by a player or coach, you can be pretty certain that the New England Patriots are playing in the big game. Actually, you can be pretty sure of that anyway - they have now made nine of 18 since Brady and Belichick teamed up, after all. But what we want to look at here is the Patriots players and coaches - and some guys from other teams - who have a huge collection of Super Bowl rings - including a few who can't fit them all on one hand. Tom Brady, not surprisingly, is atop the mountain of champions with five Super Bowl rings. Unless he can win another one here, though, he will not be alone on that summit. Charles Haley also has five. He won two when he was with the 49ers, but then San Francisco proved to be too small for both him and Steve Young. Haley headed to Dallas, because everything is bigger in Texas, and won three more titles. It's striking that aside from the number of titles, the two guys have something in common - both have a large collection of people who are far from their biggest fans. It's tough to be well loved and wildly successful, I guess. I'm sure neither guy loses much sleep about it. Brady might be the GOAT, but he doesn't even have the most rings on his team. Bill Belichick has won all five alongside Brady, but he also added two when he was the defensive coordinator for the Giants. Belichick passed Chuck Noll for most wins as a head coach with his last title. Like Brady, though, Belichick has to share his top spot overall until the Pats win another. Neal Dahlen was in the front office for the Niners from 1982 until 1995, and he won five titles in that time. And then he became the GM of the Broncos, winning the two rings that John Elway helmed. The math geek in me has to pause and just think about what Brady and Belichick have done. Like them or not, you have to respect their reign of terror. This is the 53rd Super Bowl. Together they have appeared in nine - 50 percent of the Super Bowls played in their time together. That is more than one-sixth of all Super Bowls Played. With a win here, they will have won 11.3 percent of all Super Bowls played. And Belichick has appeared in 21 percent of Super Bowls, and if he wins this one will have won 15 percent of them. If you consider the number of teams and players that set out to win one every year that is remarkable. While what Brady and Dahlen have done is very impressive, the smart money is on Josh McDaniels to eventually pass the two of them. McDaniels is still only 42, but the New England offensive coordinator has been aboard for all five Patriots rings. He was a personnel assistant for the first, followed by a defensive coaching assistant, then the QB coach, before being the coordinator of the last two wins. He'll have a long career as a head coach in this league long after Belichick has been called back to the robot factory that created him, and he obviously knows how to win. Heck, I wouldn't bet against McDaniels winning a couple more with Brady as his QB. McDaniels shares the record for most wins by an assistant coach with Romeo Crennel, another Belichick guy, who won the two with the Giants and the first three in New England. McDaniels doesn't have to worry too much about being caught by any Rams assistants. Only three on the staff have won a single championship ring - Wade Phillips as defensive coordinator of the Broncos, and Aaron Kromer as offensive line coach and Bill Johnson as defensive line coach of the Saints in 2009. No Rams player is going to catch Brady in any hurry, either. Because of their combination of being young and largely being homegrown, the Rams are short on championship experience. Their only player who has a ring to show off is corner Aqib Talib, who won with the Broncos three years ago in Peyton Manning's swan song. Receiver Brandin Cooks also has big game experience as he was part of the Patriots team that fell short in the title game last year. The last guy we have to talk about whenever we are talking about big collections of rings in Willie Davis. He won five rings when he was a defensive end with the Cleveland Browns from 1958-69, and then won two more as an executive for the Packers. His problem, though, was that when he won his first three titles the Super Bowl had not yet been created. So, he has seven NFL championships, but only four that were Super Bowl wins.